Maarten van Ryckevorsel had been working as a national sales manager in the toy industry for about five years when a “brilliant play on words” popped into his head — a wooden ruler with measurements on one side and rulers of the world on the other — and Rich Frog was born. 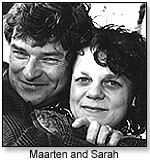 Maarten, self-described president and janitor of Rich Frog since starting the company with his wife, Sarah, in 1994, told TDmonthly Magazine how it grew from one idea into a success. It took quite of bit of time and phone calls to develop the ruler because we had to find someone who could make it for us. 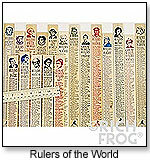 We use a U.S.-based manufacturer for the ruler, although we use manufacturers in China for other products. We have about 20 versions of the Rulers of the World, though we started out with three — the kings and queens of England and the Pharaohs. We lived off our savings for a while, and my wife had a job. I had our first prototypes in April 1994, we sold our first product in September 1994, and we did our first trade show, the Atlanta gift show, in January 1995. By that time, we had more than rulers —stuffed animals, wooden puzzles, pencil sets, wooden hangers, pajama racks, toothbrush holders and bookends. Our products are defined by a sense of design and color that comes directly from Sarah. Her color palette isn’t tomatoes and green peppers. It’s lively and bright and attractive, but not the traditional one you see in children’s toys. Our customers — almost exclusively small, independently owned specialty gift shops — are smart business people. You can bombard them with all kinds of marketing literature, but what they really want is good product at a good price. It doesn’t cost more to make a well-designed product than to make a less-well-designed product. Our best marketing tools are good products that are attractive to the buyers who put them in their stores, the adults who buy them and the children who receive them. It would be great for companies like us if we could make a product, bring it to market, and sell it for five years. But we’re under pressure to have new things for our customers all the time. We, ourselves, do the New York Gift Show, and we have reps who do all the regional shows. On our website, storeowners can register and find out what’s in and out of stock, and place orders. Two of our best-selling items are The Original Rubber Duck, made from real rubber tapped from a rubber tree by a third-generation family company in Spain, and the Reversible Hat, for children from birth to age two. One side is a frog and the other a prince, or a dog and a cat, or a princess and a pea. Two new top-selling items are Terrible Two Shoes, slippers that look like monster, duck or bear feet, and Squeak Easies, tube-shaped squeakers with animal heads on top and feet on the bottom. • The other is when we see one of our employees blossom into a new job and new responsibility. The advice I’d give to someone starting out in the toy business is “Don’t be afraid to ask questions.” Ninety percent of the people in this business are really cool and nice and will be happy to help. If they don’t, try someone else. 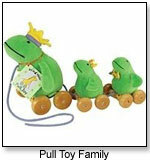 Children can watch the baby animals follow them as they pull the animals along on sturdy wooden wheels. 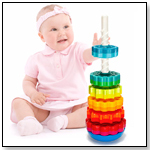 This product is intended for children over the age of 18 months. Awards: TDmonthly Top Toy 2009. Launch date: January 1, 2008. 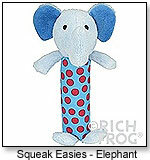 These hand-held squeakers come in six fun animal shapes and squeak with the greatest of ease. They feature vivid colors and patterns and delightful soft velour heads and feet. The squeakers fit nicely into a diaper bag or purse, ideal for on-the-go entertainment. Launch date: January 2007. Pull down on these silly creatures and their floppy legs and wings will bounce up and down hilariously on a 12” spring which extends to 20.” With 8 styles to choose from, this mobile is a must-have for any kids’ room.